Around 2,000 hectares of mostly farmland at Notre Dame des Landes in rural western France are set to be the stage for what is likely to be a violent confrontation on Saturday 17th November, when anti-airport activists square up to riot police. Protesters, battling plans to build a new airport near Nantes have organised a mass “re-occupation” rally when they will attempt to reconquer part of the proposed site after scores of them began being unceremoniously evicted by police last month. Although their campaign dates back many years, it has taken an ugly turn in recent weeks, with riot police using tear gas to break up camps of protesters who responded in kind by throwing Molotov cocktails and setting up burning road blocks. By evicting people to silence the dissent, the government has succeeded in making the situation worse. Opponents of the airport do not believe the economic justifications being made for it, and are angry about the harm that will be done to the eco-systems of the local wetlands and the rise in pollution that a new airport would bring. There are also farmers who are furious after having had their land expropriated to make way for the airport and a proposed new road system. Much of the opposition’s anger is directed towards Prime Minister Jean-Marc Ayrault, who as former mayor of Nantes was a key supporter of the project, and the company Vinci, who will operate the new airport. Protesters fighting to block controversial plans for a new airport in the west of France are gearing up for their next skirmish in what is becoming an increasingly ugly battle with authorities determined to get the proposals off the ground. Around 2,000 hectares of mostly farmland in rural western France are set to be the stage for what is likely to be a violent confrontation on Saturday, when anti-airport activists square up to riot police. 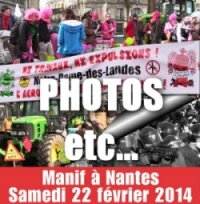 Protesters, battling plans to build a new €580 million airport near Nantes, have organised a mass “re-occupation” rally when they will attempt to reconquer part of the proposed site after scores of them began being unceremoniously evicted by police last month. Saturday’s confrontation, dubbed ‘high risk’ by police, will just be the latest in a long line of clashes between authorities and various groups united in their battle to prevent the proposed new airport at Notre-Dame-Des-Landes from ever taking off. Although their campaign dates back many years, it has taken an ugly turn in recent weeks, with riot police using tear gas to break up camps of protesters who responded in kind by throwing Molotov cocktails and setting up burning road blocks. ‘Police fanning the flames’Many have blamed the police operation, unfortunately code-named ‘Caesar’, for the increased antagonism. Opposition to the airport at Notre-Dame-Des-Landes dates back over four decades, when the idea to build a new airport for Nantes was first floated. Plans finally took shape in the 1990’s before eventually being put out to consultation in 2003. The new “Great West” airport was finally given the green light in 2008 after proposals survived a lengthy public enquiry. It was originally due to be operational by 2017, but with several legal disputes still unresolved and protesters showing no sign they are ready to give up the fight, that date appears optimistic. The government and regional authorities insist the proposed transport hub, which will cater for up to 9 million passengers annually, is essential for the region. It will replace the current Nantes-Atlantique airport, which they claim is stretched to capacity and cannot be expanded to handle the more than the 3 million passengers currently passing through its gates. Those in favour also believe the new airport is vital to improving economic development in the west of France. But on the other side of the trenches are environmentalists angered over the harm that will be done to the eco-systems of the local wetlands and the rise in pollution that a new airport would bring. They have been joined by farmers furious after having had their land expropriated to make way for the airport and a proposed new road system. Earlier this year several farmers went on hunger strike for 28 days until authorities agreed to temporarily halt the evictions. Various political groups, from the Greens to the radical left, are also supporting the protesters’ campaign. They all believe there is an alternative, cheaper and more environmentally friendly solution to the problem that would have much less of an impact on the local population. “The existing airport is being used at 50% of its capacity. It has its problems but the government have never really tried to remedy them. All they have thought about is building a second airport,” Lebouteux told FRANCE 24. Much of the opposition’s ire is directed towards Prime Minister Jean-Marc Ayrault, who as former mayor of Nantes was a key supporter of the project, and the company Vinci, who will operate the new airport. The ranks of protesters have been swelled lately by anti-capitalists who have come from far and wide to join a fight they believe has a resonance far beyond Notre-Dame-Des-Landes. One activist recently evicted from the site told FRANCE 24 that the battle of Notre-Dame-Des-Landes mirrors other social conflicts. “This is happening in many places. Immigrants were driven towards Calais, Roma gypsy camps are being dismantled and the poor are being gradually forced out of city centres. It’s all the same,” the militant told FRANCE 24 on condition of anonymity. “It is not just those who live near Notre-Dame-Des-Landes who should be concerned by this battle. It does not matter whether we come from the other end of Europe or just around the corner, we all live on the same planet,” he said. Police in France are preparing for a weekend confrontation with opponents of a new airport near Nantes, officials said. Saturday’s planned “re-occupation” rally, dubbed high risk by police, is the latest chapter in efforts to prevent 5,000 acres of farmland from being turned into a replacement for the Nantes-Alantique airport, France 24 reported Tuesday. The anti-airport campaign dates back many years but it took an ugly turn in recent weeks with riot police using tear gas to evict protesters from the proposed airport site in October. The protesters responded by throwing Molotov cocktails at police and setting up burning roadblocks. “By evicting people to silence the dissent, all the government has succeeded in doing is to help the movement gain momentum,” said Genevieve Lebouteux of France’s Green Party. The $736 million airport at Notre-Dame-Des-Landes was originally due to be operational by 2017 but that date now appears optimistic due to legal disputes and protests, France 24 said. Request for supporters to send postcards, from the organising group, ACIPA. It took nearly five hours to two squadrons of mobile police, supported by CRS, to destroy, Wednesday, November 7, the seven barricades along the main road 281, between Notre-Dame-des-Landes and The Paquelais, 15 km north of Nantes, by opponents of the new airport project. It is exactly here that should be built in one of two tracks of the future airport runways. Yesterday, Philippe, Charlotte, and Romain Renard, nurses, students, barely four hundred years they had kindled a fire which heated bitumen and allowed better dig excavating an ax to delay the police vehicles . The sweet grove Nantes became guerrillas. Face to face, both sides are preparing for a long struggle that could turn the real trench warfare. On the one hand, the government, Jean-Marc Ayrault, head, Prime Minister, former Mayor of Nantes, local promoter of the new infrastructure for many years, and the Great West Airport (AGO), 85% subsidiary of Vinci Airports, airport operator the future shouldhold its first flight late 2017. Far successfully divide the forehead, the eviction began Oct. 15 – code named Caesar who, suddenly, inspired slogans such as “Veni, vidi, vinci” or “Veni, vidi, left” – the contrary welded ranks, creating emotion and solidarity. And provides anti-Notre-Dame-des-Landes impetus for the successful demonstration on Saturday 17 November, with the objective to “reoccupy” and rebuild what has been destroyed. Hoes, forks, beams, nails, and “mirrors” to prevent police helicopters tofilm , are part of the list of equipment to bring . The rally, which couldaccommodate thousands of people, wants to raise families, political activists, union and association deemed hostile to the project “pharaonic” the “Ayraultport” , unnecessary and economically harmful to the environment, according to activists. Late Wednesday morning in a winter sun, opponents face dozens of soldiers, heavily equipped. They are caught. A young man is forced to the ground. “Take me his hood, I want to see her mouth “ , an officer yells. Most of the protesters who are able to hood and scarf ‘s escape , jumping over hedges and ditches along the D281. The voltage drop for a moment. Meadows still wet from the torrential rains of the previous days, activists watching the ballet of the police vehicles. They protect gear from the departmental territories and sea Loire-Atlantique and workers who fill the trenches and clear the road. This time, the police do not risk in the nearby woods to dislodge the huts and camps dispersed. Like the camp of the “Far West”, which includes dozens of militants. “The goal was to restore traffic on this road impassable for several days”, says Colonel Frederic Boudier, head of the device. But the road, just released, is again blocked a few hundred meters by two trees lying across. Every day the fight. Tuesday, it was the eviction of squatters and raze the house occupied. The end of this week, it may be the turn of police platoon mountain, came especially from Briançon (Hautes-Alpes), to climb the trees to dislodge militants hilltop. The prefecture has decided to “clean up” the area of deferred development (ZAD) to start as soon as the preliminary work. By the end of November, said the prefect, under an order made ​​on Biodiversity, the first transfers of insects and amphibians will take place. Residents of twelve ponds are “moved” , whose marbled newts.Drums trees sheltering large beetles will be moved. Archaeological survey work will begin at the same time. February 2013 sounded the beginning of deforestation.The construction of the airport shall, in principle, start in spring 2014. Anyway, despite the urgency, the government must wait the outcome of the actions already undertaken by the courts. For the battle is fought also on the legal front. Other procedures are ready to be launched since the publication of the prefectural on the “Water Act” by the end of December. Under various French and European regulations, there is an obligation to preserve the heads of watershed and not bringdamage to wetlands, hedgerows and characteristic features of the area of the new airport. “I always thought this folder would stop with the law on water “ , said Christophe Daugé, counselor Regional Europe Ecology-The Greens, who believes that “da Vinci can not compensate for the destruction of wetlands “ . The government side, as da Vinci, we remain confident. “Proceedings of the Water Act and the Ecological Land compensation will be mobilized respected” , insists the minister of ecology, Delphine Batho . Eric Delobel, Deputy Director General in charge of the future airport in Vinci Airports , assures him that “9 million at minimum are reserved as compensation to the Water Act “ , a total of 446 million estimated cost of the new airport facilities. Pending the outcome of this legal battle, opponents remain mobilized. Oldest evoke the struggle of the peasants of Larzac in the 1970s, when farmers and political activists had made common cause against the proposed extension of the military camp. François Mitterrand, newly elected in 1981, had declared the abandonment of the project. Who are these people who stand up to the police to Notre-Dame-des-Landes near Nantes? For several years, these anti-capitalist occupy the site on which the State intends to transfer the airport of Nantes. Month the police trying to evict them. But they resist and they have become the spearhead of the opposition. Report on how its activists frequently silent vis-à-vis the media, have built a micro society open farmland. A bakery, a theater, gardens, a forge, a wind and a radio. For three years, anticapitalist, followers of decay, have developed a micro-society in the grove of Notre-Dame-des-Landes. The occupation of the site on which the project is scheduled airport is a means of control. But over the years for some, life in the company rose to the forefront. Expelling these squatters gave the police in battle. A manifestation of reoccupation is scheduled for next Saturday. Who are the opponents who stand up to the police to the site of the proposed airport Notre-Dame-des-Landes?”Professionals urban guerrilla” as stated by the President of the Region Pays de la Loire? Or “anti-capitalist” as they arise? Rare, some have agreed to open to the media. Most of them were around thirty. Some come from other European countries. But the group is not homogeneous. Everyone speaks for itself. The common point is the struggle. A struggle that goes beyond the airport. It affects large development projects, such as high-voltage lines, the high-speed tracks or nuclear power plants. Decreasing? Altermondialists? One definition is universally accepted, that of anti-capitalist. No political party is permitted. Not even Europe Ecology-The Greens, the only party opposed to the weight of the airport project. Aggressive and creative, they have now taken the keys of the fight against the airport, which until this fall into the hands of farmers. Posted: Tuesday, November 13th, 2012. Filed in News about Airports.